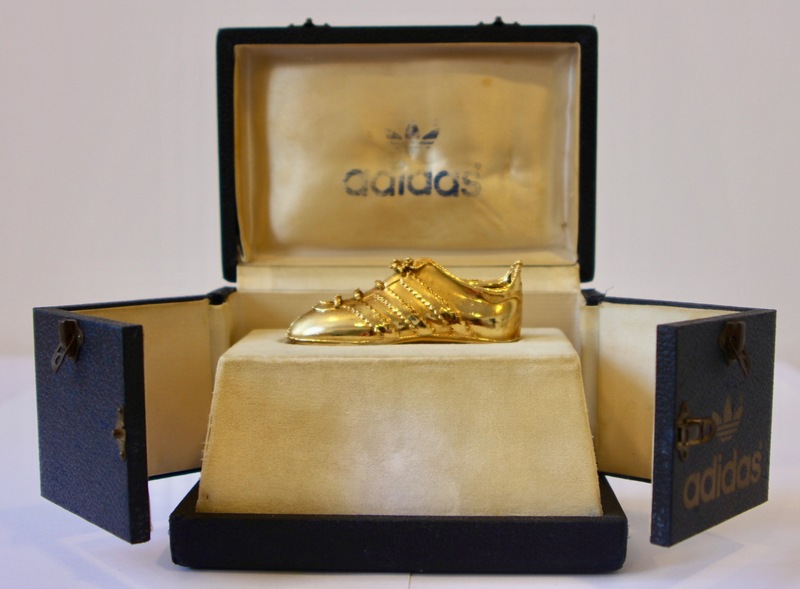 The adidas Golden Boot is not a trophy you would typically expect to find outside of the top divisions, was awarded to club legend Anthony ‘Tony’ Kellow following the 1980/81 season in which he scored a total of 25 goals in 46 appearances. Kellow outscored players both in his division and the country to be bestowed with this prestigious award. The boot itself sits in a navy-blue leather box with a yellowed lining. Kellow first signed in Exeter in the summer of 1976, and in his first season he scored 19 goals in 46 appearances, with two of these goals being scored in his debut for City in a 2-2 tie with Hartlepool. The following seasons Kellow proved just as lethal scoring 14 goals in 77/78 with 46 appearances, and another 14 in just 17 matches in the 78/79 season. By the time Kellow had been sold to Blackpool in November 1978, for a record fee of £105,000, he had scored 40 league goals in 107 matches. Kellow rejoined Exeter in March 1980, setting another club record fee of £65,000. The 1980/81 season was highly successful for Kellow, despite a mild performance from the team, netting a goal in first game back at the Park, as well as a hat trick in the FA Cup fourth round replay against Leicester City, where City won 3-1 in January 1981. Kellow played a vital role in City’s cup run, stopped only by the Tottenham Hotspurs in the quarter-finals. Scoring a division high of 25 goals, Kellow was awarded the adidas Golden Boot and City’s Player of the Year trophy. Following stints at Plymouth, Swansea, and Newport Kellow resigned with Exeter City in July 1985. Despite the sruggling team, he topped City’s goal chart though he only managed to score 9 goals. The following season, 1986/87, was more successful for Kellow as he managed to score 15 goals in 33 matches. In his final season, Kellow scored 4 goals in 16 matches, not bad for a 35-year-old. Kellow’s last game for City was the 30th January 1988 where he was introduced as a substitute in a 1-0 loss to the Tranmere Rovers.